Cambodia perfectly overlaps the apparition of ancient grandeur with modern civilization. 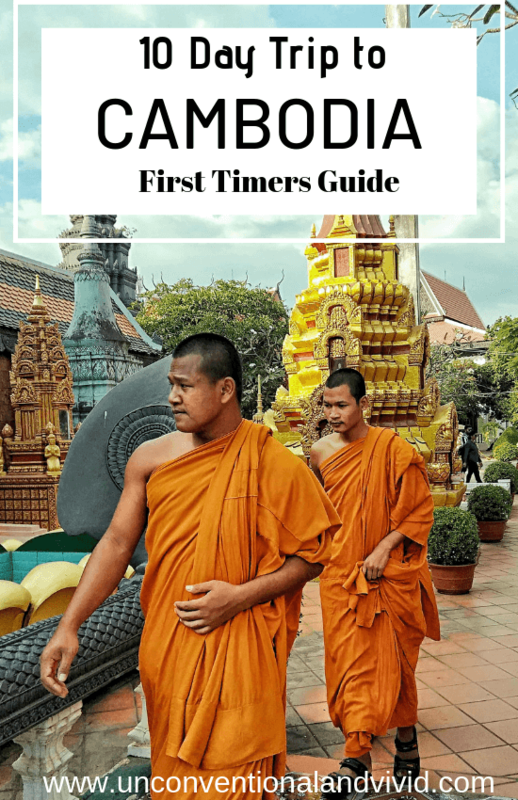 This 10 days in Cambodia guide for first timers will help you explore the marvels of the country. The UNESCO Heritage site of Angkor Wat is the reminiscence of once chaotic capital city of Khmer Empire – Angkor. The ruins of the temple extend from Siem Reap along the banks of Tonle Sap lake to south of Kulen Hills. The unexcelled architecture of Angkor Wat, quaint cosmopolitan cafes of Siem Reap, wilderness of Bokor National Park, alluvial Mekong river cutting through the kingdom and the elusive eco-tourism with a pinch of adventure, all of these make Cambodia a perfect country to pat your indomitable spirit. How to Obtain Visa for Cambodia on Indian Passport? “Kingdom of Cambodia” – The country has suffered explicitly in the hands of extreme inhumanity under the rule of Pol Pot but managed to sprout back marking a historical transition. The gory tales of their recent past still continue to haunt the slowly evolving ancient nation. If one had to scratch the history of the country, it dates back to 1st to 6th century, rightly prefixing “Kingdom” to the country. An interesting façade of the country lies in its fabled like history with first civilization known to be arising in 150 AD along the Mekong River Delta, called Funan. But it gradually siphoned the civilizations and cracked them into kingdoms with aggregation of Khmer Empire by 9th Century. King Jayavarman II was the flag bearer of the mighty Khmer Empire. The country sailed through dark days and witnessed the darkest days of horror during Khmer Rouge Era from 1975 to 1979 under the rule of Pol Pot. The present day Cambodia is like a morphological expansion, evolving and developing against its unbridled socio-economical problems. The country has endured a lot of pain, suffering, poverty and bloodshed but the people of the nation refused to give up. The journey to hell and back has taught the Khmers to be humble, celebrating an unmatchable spirit of never giving up. 10-days are nowhere even close to time required to explore the beautiful ancient country but time crunch plays the mastermind here. I clubbed my trip with a 2-week trip in Thailand. 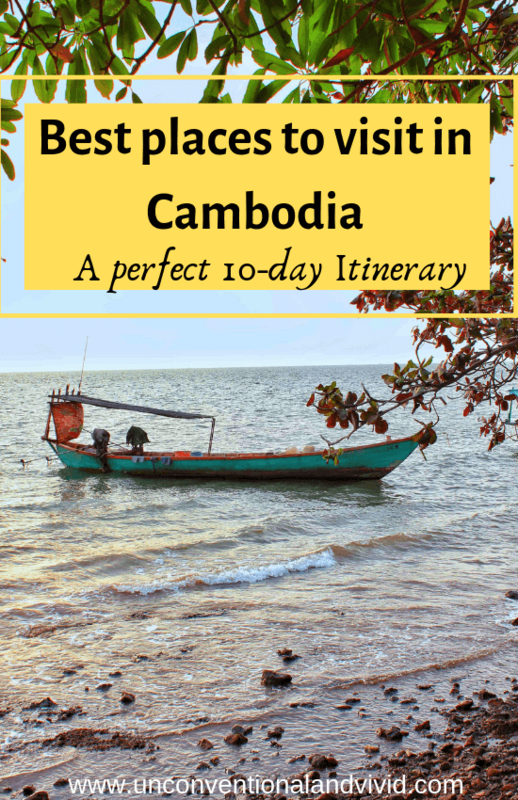 If you are not that into beaches, this itinerary perfectly chalks out what to see in Cambodia in less time. Siem Reap is slowly brewing in it a community of digital nomads with its close proximity to Angkor Wat, rich history and of course the quaint cafes. The small airport of Siem Reap connects flights from multiple cities worldwide to Cambodia. The VOA process is pretty easy and does not consume much time. It is better to get an e-visa for an extra $6 to skip the queues. I had an early morning flight from Phuket to Siem Reap and reached Siem Reap at around 7.45am. How to reach the city from Airport – A lot of travelers opt for overland crossing but in my case, I choose to fly from Thailand. The best way to reach the city center of Siem Reap from airport is by hiring a Tuk Tuk that will cost around $7 to 10 USD. You can also have a pick up arranged from your booked accommodation. Place of Interest – Angkor Wat, Bayon Temple, Ta Prohm, Banteay Srei Temple, All Temples included in the Angkor Wat ticket, Floating Villages at Tonle Sap Lake, Wat Preah Prom Rath, Wat Bo, Pub Street. I recommend staying at The Local Time Village for an amazing breakfast, great amenities with warm hospitality, free airport pick up and walking distance from Pub Street yet away from the crowd. Countryside Cambodia is often negotiated by a lot of travelers for the pristine and alluring beaches of Koh Rong. Kampot is a sleepy town which is the gateway to Bokor Mountains and National Park on the banks of Praek Tuek Chhu river. The awe inspiring 19th century French colonial buildings, exotic pepper plantations, salt farms and riverside fun, Kampot is an enigmatic countryside emotion to float in. Kep is 20kms from Kampot and is pretty organized with good roads and colonial influence. There are overnight buses from Siem Reap to Kampot available at around $18 to 26 USD. They are not direct buses but at the diversion towards Phnom Penh, the passengers for Kampot are shifted to a minibus in the morning. I recommend staying at Meraki Kampot to soak into the soul of the place away from the chaos. Or else you can also choose to stay in the town close to the French colonies. After hearing dozens of infamous pick pocketing, robbery and snatching stories of Phnom Penh, I almost lost my interest in exploring Phnom Penh and used the city just as my exit point. There are minibuses available from Kampot to Phnom Penh or vice versa ranging from $7 to $15 USD and takes around 4 hours to cover the distance. The process of obtaining a visa to Cambodia is super smooth and easy. Cambodia offers VOA for most of the countries (Please check eligibility). The first option is visa-on-arrival that cost $30 USD and is an easy on-arrival formality. The second option is to get an e-visa through their official site (https://www.evisa.gov.kh/) for $36 USD. VOA can be obtained at Siem Reap and Phnom Penh airport along with many other land crossing connecting Thailand and Vietnam. Click on this for more information. There are all types of accommodation in Cambodia suitable for budget solo backpackers to high end luxury travelers. The hostels in Cambodia can range from $2 to $15 USD per night with breakfast. I used booking.com throughout my trip to book accommodation. For couples, it is recommended to use AirBnB for locating budget accommodation. 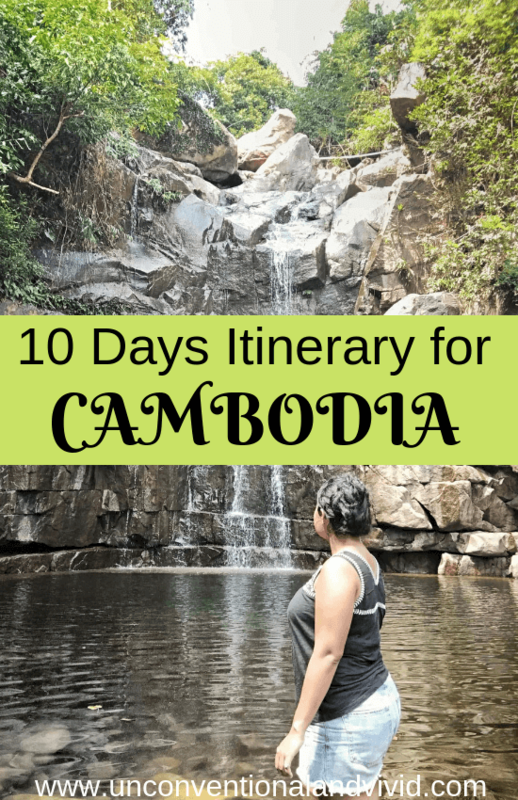 This 10 days in Cambodia itinerary has information of all accommodation I stayed in. I stayed at The Local Time Village in Siem Reap and highly recommend the place. It has both dorms and private rooms with complementary breakfast, swimming pool, tours and guide arrangement, booking facilities etc. In Kampot, I stayed at Meraki Kampot and absolutely loved the vibe. It is adjacent to the river and away from the city center tucked in lap of nature. It is around 5 to 7km away from Kampot town center. The center of the town is also good for accommodation with cosmopolitan cafes, alluring dining options and little organic cafes. Phnom Penh has wide range of cheap accommodation with some hostels available at as low as $2 with complimentary breakfast. The most common mode of transport within cities is rented bikes available at price of $5 to $8 USD per day depending on the region. Siem Reap can be a little more expensive as compared to other regions. There are comfortable overnight buses that connect one city from another like Siem Reap to Sihanoukville, Kampot, Phnom Penh etc. There are minivans that connect smaller distances of 4 to 5 hours. Mostly all accommodation places have complete information about it. The boats and ferries connect to the Islands and the tickets can be purchased clubbed with transportation with buses. In Siem Reap, Phnom Penh and Sihanoukville, it is highly recommended to use Pass App for calling a Tuk Tuk. Download the Pass App in your phone and use Tuk Tuks at fair rate. Tuk Tuk are best option if you don’t know how to ride a bike for full day tours in and around a particular city. Normally charges for full day Angkor Wat trip costs around $15 to 25 USD, full day Kampot and Kep tours cost around $20 to 25 USD etc. The last option is to book day tours which include transportation, sight-seeing, entrance fees, food etc. Food and Miscellaneous Roughly I spent an average of $7 to 12 on food every day. In Cambodia, lager beer is super cheap and cost around $0.50 to $1 depending on the place. The cost of renting a kayak or paddle boat in Meraki Kampot is $5 for an hour. Total Roughly I spent around $450 including flights for my trip to Cambodia but if you know to ride a bike, it can further cut the cost. Cambodia accepts USD (American Dollars) as alternate currency apart from their Cambodian Riel. Everything is mostly listed in USD and hence there is no need to convert the currency into Riel. It is important that the USD note is in perfect condition to be accepted in Cambodia. Even a small tear or rip will make it unacceptable. Try not to use the credit card when not required as most of places take $3 as charge for every payment made using cards. The ATM charges a flat $5 for every transaction as fee for withdrawing cash from international debit card. Always book an accommodation with complementary breakfast to save money on food. The road side food in Cambodia is cheaper that starts at $1 to $1.50 for a plate of fried rice, noodles or traditional food. Normally in a fancy restaurant, the price for food starts at $4 USD and goes beyond. Price of coffee is around $1, price of coconut water is around $1.50 to $2 etc. Fruits are cheaper in Cambodia. Cambodia can be a menace when it comes to mosquitoes and insects especially while hiking through the jungles. Do not forget to carry mosquito repellent, insect repellents etc. If you have extra time or plan to spend a month, do plan on visiting Battambang, Sihanoukville, Koh Rong Island, Kratie, Sen Monorom etc. Cambodia is a country that is still at nascent stage of development after being afflicted severely by civil wars and witnessing plethora of bloodshed. Home to the ancient Angkor Wat temples, the country is a perfect intertwine of medieval with modern. 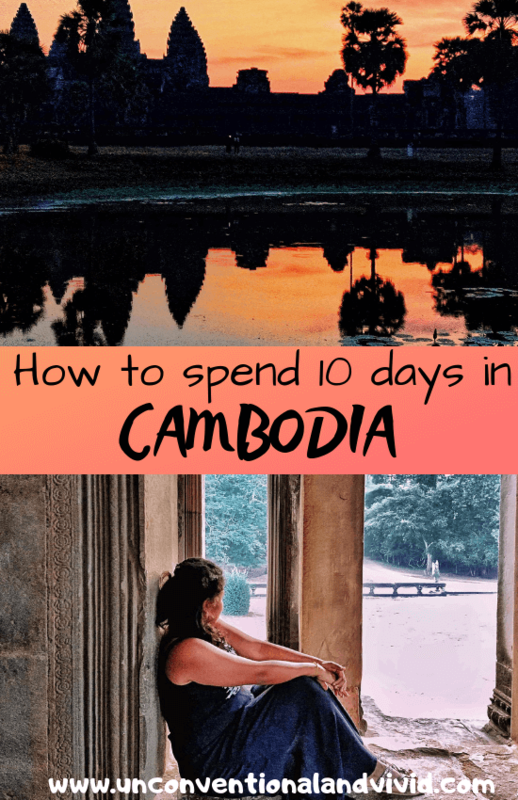 Be it the ruins of the once capital city of Angkor city or a taste of countryside life, this 10 day trip to Cambodia was a beautiful experience. Great pictures of Angkor Wat! This is a great outline. I’m hoping to go to Cambodia in 2020. I’m also a teacher as well! You got some great shots of Angkor Wat! I spent some time in Cambodia a few years ago and I think you covered some of my more favorite parts of the country. Thanks for sharing!! Wow so much information here, this is awesome! I’m heading to Cambodia in a month or so and I’m really looking forward to it, especially to the countryside parts. Ahh this made me want to go back to Cambodia! I loved going there, but I only had 3 days. I’d love to explore more of the country one day! Your photos make Cambodia look both pretty and interesting. We haven’t been before, but my dad has. He really likes that part of the world. I didn’t see rental cars in your options for transportation. Are they a good idea or not really. That’s what we usually do. I’ve heard so many great things about Cambodia! I really need to get there – I’ll be keeping your guide in mind when I do so that I make sure I budget enough time for all the destinations! Thanks a lot for reading. Cambodia is a hidden gem and beyond Angkor Wat actually lies the charm of this ancient country. I love exploring countryside regions! That last photo is so pretty! I wish I had spent 10 days in Cambodia instead of 3…what an amazing country, and your posts shows me just how much I missed! This is perfect for planning my trip this year!! I’ve been before but I was only in Siem Reap and I missed alot of the good stuff <3 Also amazing photos, I love how you captured the country.